Does the APRL keep everything we scan? In the past 5 years, the APRL has made a shift from providing mostly photocopies of articles requested by members to providing mostly digital scans. 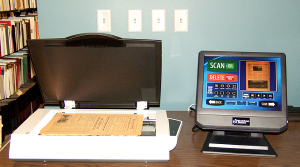 The shift is due to a combination of factors: we acquired professional book scanning equipment, which allows us to make better quality scans more efficiently and consequently prompted us to lower our scanning fees, and more and more members are asking for library resources in digital format. 1. Copyright law prohibits us from keeping copies of publications that are protected by copyright. The copies we make for individual members are made under the Fair Use provision of copyright law for individual research and study. We are not permitted to archive and reuse these copies or to share them online. 2. Archiving scans of articles would require good indexing so that they could easily be retrieved again, as well as significant server space to store the files. Because requests are rarely for the same article, saving these scans is not a good use of our limited resources. There are exceptions, however. When we scan a public domain work in its entirety, we can and do save and archive the scans, and later make them available online through our library catalog. There are currently more than 250 records in the Philatelic Union Catalog in the location “Online,” which means the record either has a digital file attached or contains a link to full text available from another source. 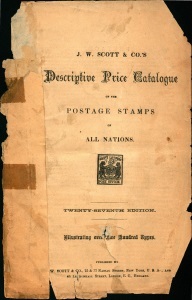 One example is the 27th edition of the Scott Catalogue (published in 1873), which we have scanned and made available online. For more examples, select “Online” from the drop-down box when you search the catalog or look for records with “Online” in the location. In addition to saving scans of public domain works, our digitization strategy also includes proactively digitizing works in the public domain (such as pre-1923 publications and government documents) and works that we can secure the rights to (such as publications produced by and copyrighted by the APS or works the copyright holder has given us permission to digitize, such as our collection of online exhibits).